Fried chicken is the best food in all the land. It’s a known fact. You know what makes it even better? Soft, fluffy bread. Oh, and cheese. 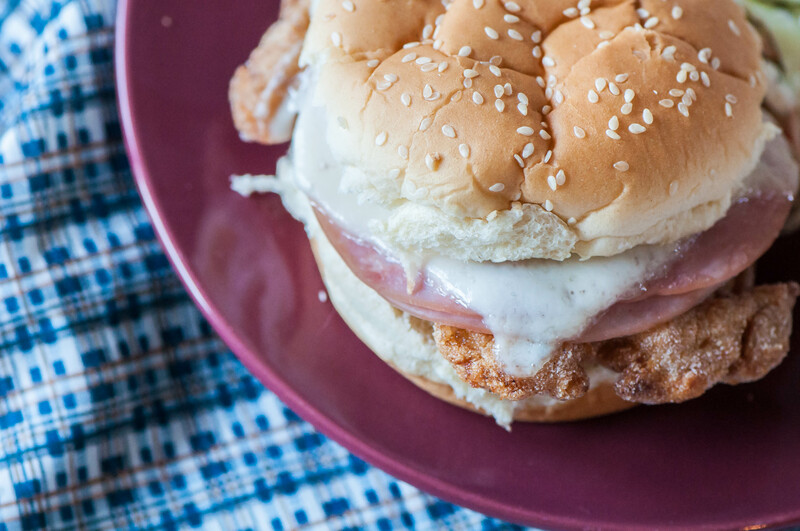 These Chicken Cordon Bleu Sandwiches will be a family favorite in no time. School starts up in 11 days. 11 DAYS. This summer was our busiest yet and totally flew by. 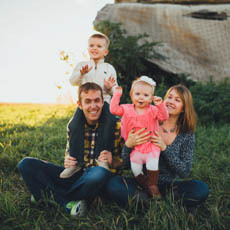 Noah’s open house is next week where we will get to meet his teacher and see his classroom. Hannah is starting preschool this year and is going 3 half days a week. I can’t believe both of my babies will be in school. I’m not going to lie, I’m ready for school and a little time to myself. The fighting between those two has gotten out of control and I think they are ready for more of a routine again. With school and sports and activities approaching, I have had simple, 30 minute meals on my mind. We don’t eat fast food often but on those busy nights we occasionally run through the drive thru for dinner. Noah is still pretty picky at this point so it’s hard to find even a fast food place he will eat (he’s not a fan of meat so that makes it tricky). But we are all fans of Arby’s (those curly fries though) so it’s a popular go to when we don’t have time to cook. My favorite go to there is the chicken cordon bleu sandwich. The crispy chicken, salty ham and melty cheese gets me every time. Even though it’s not the healthiest of choices, it’s delicious. I decided to create a copycat recipe to make at home so I can control the ingredients and quality. It makes for a quick and tasty weeknight meal that we all enjoyed. Turns out if you put something on bread my kids are wayyy more likely to eat it. They get it from their mama. I love the light, crispy coating rice flour provides along with a double dredge to bring the crispiness home. If you don’t have rice flour and don’t want to buy it for one recipe, feel free to use all-purpose flour instead. It won’t get quite as crispy but it’s still fried chicken so it’ll be all good still. Thinly sliced honey ham brings some sweetness to counteract the sharpness of the Swiss cheese. Slather the bun with a mayo and Dijon mustard mixture to make it a little fancy and provide another tasty kick. So there you have it. Another tasty family pleaser that will be on the table in less than 30 minutes. Heat oil in a pan over medium heat (about 1 inch up the pan). Grab two pie plates. In the first combine the rice flour, salt, garlic powder, paprika, pepper and onion powder. In the second, whisk together the egg and milk. First dredge the chicken in the rice flour then fully dip it in the egg wash then again in the flour. Set on a plate until all the chicken has been dredged. Preheat the broiler for melting the cheese later. Meanwhile, place a wire rack over a baking sheet and set aside. Add the breaded chicken to the hot oil and cook for 3 to 4 minutes per side, until golden and cooked through. Remove from pan and place on wire rack to drain. Once all the chicken has been cooked, remove it from the wire rack and wipe down any oil that may have dripped on the baking sheet. Place the chicken onto the baking sheet. Top each piece with two slices of ham and a slice of cheese. Place under the broiler until the cheese is melted. Combine the mayo and Dijon mustard and slather on the buns. Place chicken on the buns and enjoy. These look great, but the directions are not clear enough. Why heat oil if you’re just going to broil them instead of fry them? I suppose “cook chicken for 3 to 4 minutes per side” is the frying part. I’ll give it a try. Thanks for the recipe. Sorry the directions are confusing Sarah. I’ll take a look and update them so they are clear.